After my last blog post I received a wide range of feedback from teachers, students and general members of the public about what they felt PE should be and consist of. Understandably there was an extensive range of views, and many interesting points were raised. What got me thinking was the argument about what was most important: ensuring students enjoy PE and have fun, or ensuring they improve their fitness or skill level in particular activities. Now most of us in the profession would agree that these are equally important, and in a perfect world we would want all of our students to love our subject as much as we do, but we are also under pressure to ensure that progress is made. I sometimes wonder how this affects our teaching, and specifically if we still allow students enough opportunity to play; to experiment, to be creative, and to self-police their activities and their learning. 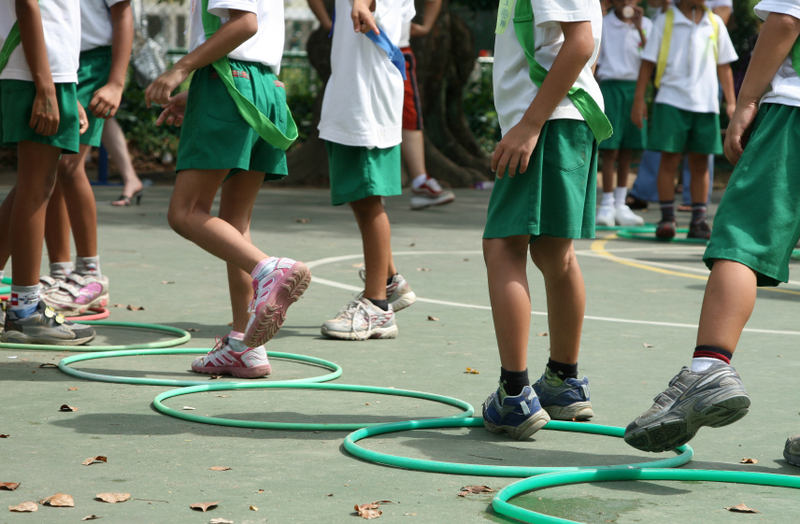 I am a huge advocate of developing physical literacy and key skills at an early age, but I think it’s important to do this by giving younger students opportunities to learn skills through play and discovery during less structured activities. Setting students challenges, such as obstacle courses, and letting them experiment with different types of movement to find the most effective ways to complete them is one example of how I try to foster this creativity in my lessons whilst still getting students to practice those key skills. Even better is getting them to design a challenge themselves, and allowing them to decide on how the activity should be run from start to finish. When I grew up I used to play out in the street or at the park with my friends for hours. We would set our own rules, adapt the pitch size depending on how many players we had, and pick teams that were fairly matched by ability without any adults present. When I am on duty in the playground at school, I often watch students do exactly this, and very rarely do I have to intervene. But when it comes to curriculum lessons or extra-curricular sport, do we allow younger students this same opportunity to self-police? If not, why not? And could we be doing more to consistently deliver sessions that promote the development of a wide range of skills, rather than the mastery of one particular skill or sport? Jean Côté is a professor and researcher who has written extensively about youth sport development, and he explains that sampling multiple sports in multiple forms is good for children’s development. This model proffers two different sporting trajectories that children may follow; recreational participation and elite performance. According to Côté and his colleagues, these trajectories begin in adolescence and prior to this children encounter what is known as the ‘sampling years’. The different pathways that children follow are determined by both the type and amount of involvement in sport activities, as well as the roles of key social influences (i.e., parents, coaches, PE teachers and peers, and other external factors). The DMSP also highlights the relative contributions of what Côté and colleagues term; (1) deliberate play; (2) deliberate practice; and (3) competition (see footnote for definitions). During the sampling years (6-12 years of age), this model suggests that children should engage in a significant amount of deliberate play, which are those activities that are specifically designed for the purposes of enjoyment and are governed by age-appropriate rules. Regardless of whether children go on to become the next Ronaldo, or continue to participate in sport and physical activity in later life; enjoyment, the chance to be creative, and exposure to a wide range of sporting experiences and activities is key. During my career I have encountered many children who excel in one particular sport (golf, tennis, gymnastics, etc). They are exceptional athletes who perform to a very high level in that sport, and who often go on to compete in international competitions or receive scholarships to universitiy. However, more often than not, when placed in a different sporting environment (e.g. a football game) they struggle to adapt and transfer the skills they have, and it is clear how one-dimensional their learning has been. On the other hand, I also regularly teach students who may not be exceptional in one particular sport, but who can turn their hand to any number of activities and be successful. For me this has highlighted the importance of play, and of sampling a variety of sports from an early age, regardless of whether that child then goes on to specialise in a particular sport or not. Ultimately, the most important thing I can do as a teacher is to help my students develop a love for sport regardless of their ability. The FA recently rolled out some changes to the structure of their youth competitions to try and make them more ‘child-friendly’ and age appropriate, and there are many other national governing bodies in the UK, including the RFU, the British Amateur Rugby League Association and England Netball that have increasingly adopting more of a child-friendly and developmentally appropriate approach to the way in which they organise sporting competition. Specifically the FA have tried to create more of a focus on the physical and mental development of young players by offering alternatives to the traditional season long league formats which can sometimes create more of a hyper-competitive environment that places unhelpful pressure on children to ‘perform’ rather than just ‘play’. One of the key reasons behind these changes was to help ensure that all players get an opportunity to participate and progress rather than just the strongest or most skilful players, as they recognise that all children develop at different rates. They also wanted to move away from youth games simply being miniature versions of adult competitions. Dr Mark Wilson and Dr Sadie Hollins of the University of Exeter carried out a study on these changes and found that interestingly, when both players and parents were approached, it was the players who understood why it was important to have opportunities to play that were developmental rather than competitive in nature, and the parents of players who were more resistant to this change and felt it could be detrimental to their child’s progression. When I reflect on my own practice, I often wonder if I provide my younger students enough opportunity to ‘play’ in lessons or team practices. I am also aware of how easy it is to impress adult attitudes and expectations on them without even realising I am doing so. I believe that enjoyment is key to students physical development, and opportunities to play, create, and experiment should be offered regularly and extensively, in PE lessons, during recreational playtimes and at after-school activity sessions. I remember once hearing someone talk about street soccer-players in Brazil, who become extremely skilful despite having no coaches, no facilities and often low-quality equipment. How do they do this? Practice. Trial and error. PLAYING. Over and over, not because they’ve been told to, but because it’s FUN. I honestly believe that it is possible for students to have high-quality learning experiences whilst they are having fun, and that having fun makes the learning more meaningful for them. Let’s not let targets and adult pressures and expectations remove the most important element of PE and sport from the experiences of our students. As always, both myself @LauraD_PE and Dr Sadie Hollins @drsadiehollins, who co-wrote this piece, would be interested to hear your views and feedback. Please connect with us on Twitter for further discussions. Deliberate play is unstructured activity usually led by the participants themselves and engaged in with fun as the intention. Deliberate practice is structured activity, either performed alone or led by a coach, which is engaged with performance improvement as the intention (e.g., technical and tactical drills). Competition is structured activity against other teams or individuals in which the intent is to win.